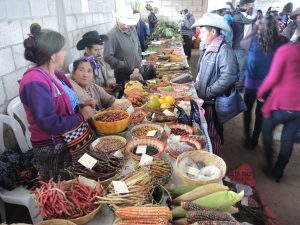 Seed fairs are gaining in popularity around the world, and are a great way to encourage farmers and gardeners to conserve global biodiversity. 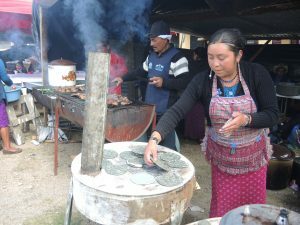 But the fairs can do more than just provide an opportunity for people to exchange and sell seed, as I recently learned during a visit to Guatemala to make a farmer training video on farmers’ rights to seed, with a particular focus on women in biodiversity management. In Guatemala, donor agencies and organisations have supported community biodiversity conservation initiatives for over a decade. Our local partner, ASOCOCH, is an umbrella organisation of 20 cooperatives and farmer associations, representing some 9,000 farm families in the western highlands of Huehuetenango. On Sunday, one day before the actual seed fair starts, we visit the venue. The seed fair has become a large annual event, unlike in Malawi, where seed fairs are less regular. The fair attracts hundreds of people from across the highlands, some travelling long distances. One elderly woman told me she rode a bus for five hours to get there. The seed fair is a lively, social event, with a Ferris wheel, stalls with amusement games and one with wooden, artistically carved horses with leather saddles on which people can sit and have their photo taken against a painted background of lush vegetation, complete with mountains and waterfalls. Visitors can buy sweets and nuts. A young boy gently pushes his wheelbarrow full of mandarins for sale through the crowds, while indigenous women sell traditional delicacies. Families with grandparents and kids relish the event as the region does not have such a large fair very often. But there is more to the fair than having fun and eating. The seed fair is held on school grounds and I soon see farmers in intricately woven, traditional clothes lining up to register for classes. 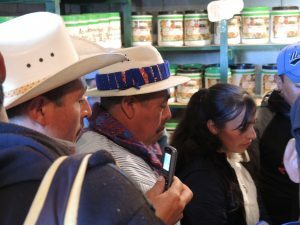 There are four large rooms where farmers can learn about potato, agrobiodiversity, climate change and women’s rights. My wife Marcella and I first attend the talks in the agrobiodiversity room, where Juanita Chaves from GFAR explains about farmers’ rights to seed. To my surprise this is followed by two presentations on aflatoxins in maize by staff from a local NGO. The presenters graphically explain the relation between mouldy maize cobs and the disfigurement of children and internal organs. As most farmers conserve their own maize seed they need to be aware of the risks of fungal infections. I am still a little puzzled as to how this relates to the seed fair and agrobiodiversity conservation, but after lunch all becomes clear. We accompany the farmers who attended the aflatoxin sessions to the Clementoro Community Seed Bank, less than 10 kilometers away. The farmers see seeds stored in plastic jars, clearly labelled and neatly stacked on the shelves. In the middle of the room, a young agricultural graduate working at the seed bank shows farmers how they can detect if their seed is contaminated with aflatoxins by using a simple methanol test. “When you store your maize crop and seed, you need to be sure it has less than 13% moisture so that moulds will not develop,” the enthusiastic young woman explains. “Here at the seed bank, you can have your seed tested and conserved in optimal conditions,” she continues. Seed is one of farmers’ most precious resources, and storing it at a community seed bank requires lots of trust. They need to know that their seed will be safely stored until they need it, either for the next growing season or even a few years later whenever the need arises. 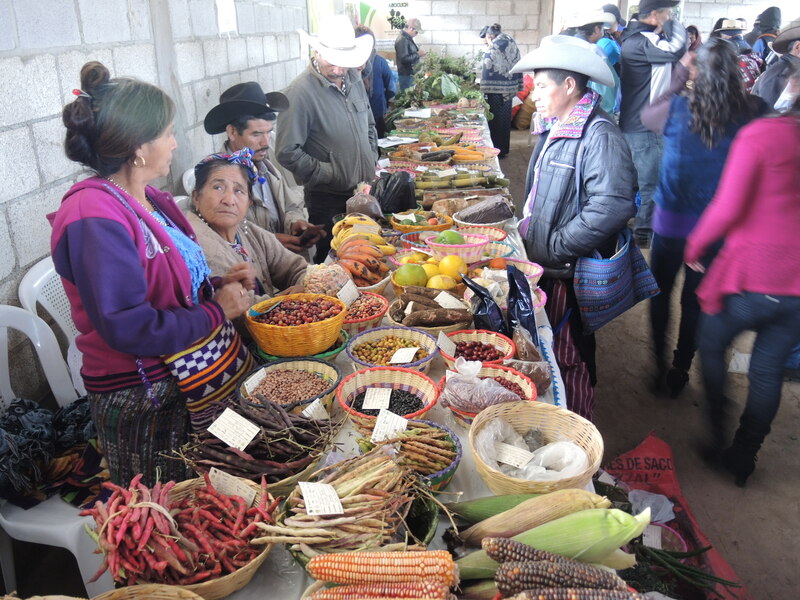 By organising seed fairs, seminars and visits to community seed banks, ASOCUCH is building trust through sharing knowledge and explaining clearly what they do. The next day, we film the actual seed fair itself. There is an overwhelming abundance of crop varieties, fruits, medicinal and even some ornamental plants. Farmers and their families are clearly excited as seed and plant material changes hands. There is brisk trading between farmers. While some exchange materials, most sell and buy seed. People tell each other about the seeds they have on offer. ASOCUCH, with the support of GFAR, had also prepared a booklet with traditional recipes. Copies are spread on tables at the entrance and they run out like hot cakes. There is a judging competition to find the best seeds. Judges visit each stand, measuring maize cobs, counting seeds, weighing potato seed tubers and taking notes. Agrobiodiversity is a serious matter. At the same time, outside the schoolhouse, sheep are being rated by another set of judges. In the late afternoon, the results are shared with the audience. People had brought dozens of varieties and over a thousand accessions of various crops. The audience is excited, and so are we. This has been a fascinating two-day event, and the drive of the farmers and their organisations has made us hopeful for the future. Local initiatives are where conservation begins, but they need the support of local authorities, governments and international organisations to increase their impact. Everyone has had a good time. More importantly, farmers have made new contacts, acquired seeds of traditional varieties that may have been lost in some areas and helped others to preserve them in new areas. 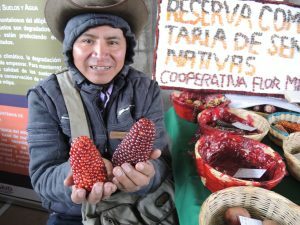 They have learned about saving seed, but most of all, the farmers have learned that they have certain rights to seeds—they can plant their own native varieties as they wish, for example—and that these rights mattter hugely in sustaining local agriculture. Thanks to the Global Forum on Agricultural Research and Innovation (GFAR) and the European Union for funding the production of the video discussed here. Support in Guatemala was kindly provided by the Asociación de Organizaciones de los Cuchumatanes (ASOCUCH).